Scott, Charlene and Henry are speechless, as Madge demands an explanation. They explain that they just wanted to give them a big wedding. Harold asks if all the people on the seating chart have actually been invited, Henry replies they have. Harold says he cannot believe how they could have interfered in something so personal. Charlene is angry and says seeing as everyone has been invited it's too late. Madge tells the kids to leave so she and Harold can discuss the situation. 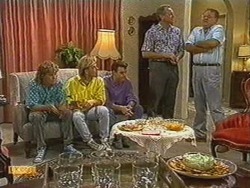 Scott, Charlene and Henry arrive and tell Helen, Jim and Paul what has happened. Henry thinks Harold will use it as an excuse to call the wedding off. Madge thinks it was a lovely idea and thinks they should go ahead with the wedding Scott, Charlene and Henry have planned. Harold isn't happy and thinks they should have the wedding they wanted; besides it's his duty to provide for Madge not the kids. Harold also feels that the church will be overloaded with Ramsay relatives and just David representing the Bishops. Madge agrees that they should stick to their small wedding. The Robinsons and Ramsays are gathered waiting for news of the wedding. Madge arrives and says she's not angry with anyone. However she and Harold still want their small reception. She tells Paul and Gail she can't accept the function room and tells Charlene she will have to call all the guests an uninvite them. It's the following morning and Charlene is still calling relatives. Henry thinks Madge is mad to have turned down Paul and Gail's reception offer. Harold arrives and tells Charlene he's not angry anymore, in 24 hours he will be married to Madge and will be the luckiest man in the world. Harold says he hopes David will arrive in time for his bucks party. 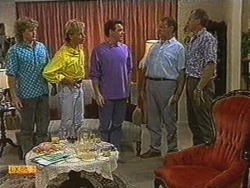 Henry is stunned and tells Harold they haven't organised a bucks party because they thought he'd be against it. Harold says he's against drunkenness but not against having a good time. 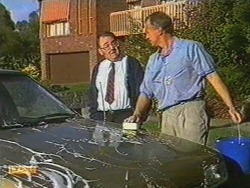 Jim is washing his car when Harold approaches him. They talk about the wedding and Harold says he's looking forward to joining the married men in the street. Harold talks some more about David and tells Jim how proud he is of his son. He also invites Jim to his bucks party. Paul and Gail are leaving for work. Harold stops them and invites Paul to his bucks party. Gail says she's not sure she wants Paul to go and is worried Harold may lead him astray. 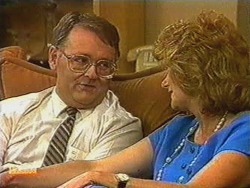 Harold says he wouldn't dream of it before realising that Gail was just joking. 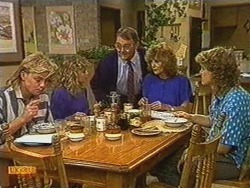 Scott and Charlene are talking to Jane about the wedding. The bucks party will be at Ms Mangels house as she is out for the evening. Harold thought it was the least she could do seeing as she knew about the big wedding plans and never told him. Scott says they now have to work out what to get Madge and Harold for a present now that they're not surprising them with the big wedding. 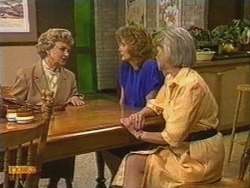 Helen arrives with flowers and tells Madge it's a token of her guilt. Madge says she has nothing to feel guilty about and invites her in. They talk about Harold's bucks party and decide they will have a hen night for Madge. There's a knock at the door and Madge opens it to find Edna. There's no sign of Dan and Edna tells Madge he's in hospital as his ulcers have been playing up again. Jim, Paul, Scott and Henry arrive for the bucks party. He tells them to help themselves to the crisps and punch! The lads realise they're in for a dull night. Helen, Madge, Charlene, Jane and Edna are gathered for the hens party. Gail arrives with presents for Madge and bottles of champagne for the girls. They crack them open and start the party. Harold is passing around his holiday snaps. The lads are close to falling asleep and Scott suggests some music. Harold gets up and switches on some Mozart!! Harold says when David arrives the party will really kick off as he's a wild party animal. 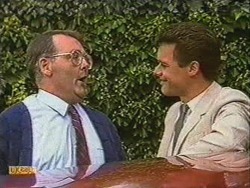 Harold: It's a matter of ‘lock up your daughters' when David's around. Charlene and Jane are teaching Edna how to dance. Gail asks Madge if she's excited and Madge says after the wait she's had she's very excited. The lads make their excuses to leave but Harold says they have to stay so they can meet David. Harold answers the door and brings David in to meet everyone. He is a clone of Harold and as they stand together the lads reaction is a mixture of shock and laughter!